It is important to get it right when you travel to the edge of the world. To honour the farthest eastern city’s local tourist bible, "Globus Vladivostoka" (The Globe of Vladivostok), RIR has created its own spinning globe to uncover the secrets of Russia's only oceanfront metropolis, while avoiding its tourist traps. The first major Russian city to greet the new day and each New Year is Vladivostok. A huge 9,000 kilometres and seven time zones lie between this city and the Russian capital. National Geographic lists this very cosmopolitan city among the world’s 10 most beautiful ocean front cities. It is common to see sailors from across the world on the streets of Vladivostok, as usual as it is to hear the call of seagulls and to see foreign tourists get in the wrong side of mostly Japanese-made cars. 1.The finest time to visit Vladivostok is between early August and end October. Seasons in Primorye are around a month apart from those in central Russia. 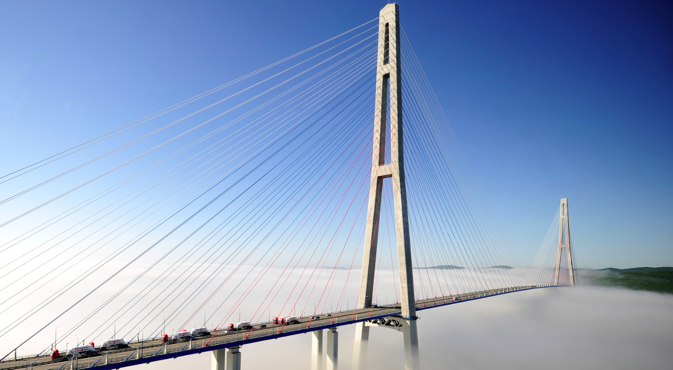 In July Vladivostok hides its beautiful bridges in fogs thicker than those of London in the winter. Local residents wear waterproof parkas and do not even think of going to the beach. However, in September, the balmy weather often allows for swimming in the ocean and sunbathing. In October, when the trees in Moscow have lost almost all their leaves, the Primorsky region experiences its annual peak of sunny days. Do not miss the fall colours of Vladivostok; they appear on the multi-coloured sopka hills against the backdrop of the ocean's blue. Winter is not a good season to visit, while Spring is usually long and foggy. The best way to reach Vladivostok is by a direct Aeroflot flight from Moscow. In eight and a half hours, you are transported to the world’s edge. A flight from St. Petersburg takes nine hours, while flights from Tokyo, Beijing or Seoul are a mere 2 to 3 hours long. Vladivostok's international airport is located near the Knevichi village, 38 kilometres away from the city. Aeroexpress trains (most frequent for morning arrivals) take passengers directly to the city centre in 45 minutes. Keep an eye out for the spectacular view of the bridge over the Zolotoy Rog (Golden Horn) Bay along the way. 3. Packing tips: to get off to a good start with the city take the most comfortable running shoes and boots you possess; they will help you negotiate the steep rise and slopes of the “Russian San Francisco.” Don't forget a knitted hat, thin thermal innerwear and a waterproof and windproof jacket to withstand the piercing ocean winds. Take your bathing suit just in case the local climate turns on its charm and surprises you with warm weather. If interested, take some hiking or surfing equipment along when you pack, but leave the surfboard at home – they are easy to rent in Vladivostok. 5. Explore Russky Island by car? Before renting a car to explore the beaches of the Shamora district, hug forest deer and watch tigers in the Primorsky Safari Park, or take a look around the secret bays of Russky Island you should be aware of one of the city’s charming paradoxes – unlike the rest of Russia, cars here drive on the right side of the road, and their steering wheels are on the right side as most cars are imported from Japan. This paradox is described in novels and is even the subject of a planned monument. Believe me, it is better to take a taxi. Taxi services can be reached at 8(4243)511115 and 8(4232)730073. Rides start at 250 rubles ($4); it is not common to tip to taxi drivers.